Siren Productions & SCALA along with Cultured the Magazine, DesigningSL, Dope Magazine, ECLIPSE Magazine, iNOVARE Magazine, L'HOMME, ModeLS Magazine, Seraphim, SL Live Radio welcome you to Menswear Fashion Week 2015 March 27th-April 4th, 2015! Menswear Fashion Week has been around for six years and always brings great fashion, exciting shows, fun parties, and fashionable men to the forefront of the grid. We have some very exciting things planned as we take a vacation and get ready to jet off on an island hop to tropical locals. 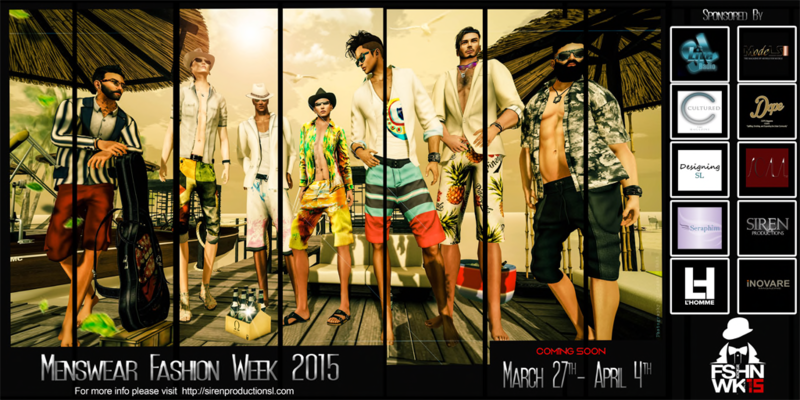 Siren Productions is bringing you the brightest and best of Mens Fashion in Second Life! Siren is so proud to have so many wonderful designers back with them on their exotic holiday this year including: Gabriel, Faster Pussycat, Akeruka, Gizza Creations, Dynasty, Vitamen, Aitui, SWAGGA, and Zibska to name a few. Having booked their ticket and joining them this year are some hot new designers Cool Nerd, CREDO, Tellaq, Tag, BOND7, ILLMVTIC, and David Heather. Siren Productions will have everything you are going to need on your vacation to paradise from hair and skins right down to shoes and accessories! This will be Siren Productions second year participating with Relay for Life. They are so excited! Siren wanted to raise 100K last year and managed to raise 150K. This year they want to double that and raise 250K! To do that, Siren Productions has organized game nights planned with Cultured the Magazine and iNOVARE Magazine. They have a 12 Hour Dj Dance Event with SL Live Radio on the 5th of April, 2015. Siren Productions is also producing 6 hours of Art & Jazz by the sea. Not to mention all the designers that are creating releases just to benefit RFL! Hope to see you all at Menswear Fashion Week 2015!